The field of quality management lost one of its founding fathers last week. Dr Joseph M Juran was a charismatic figure whose contributions helped shape the Quality function as we know it today. Juran’s contribution to the Quality field goes beyond statistics and equations. He helped define the terminology, methodologies and processes for the Quality field. Juran's Quality Handbook is the Quality Bible and his “trilogy” books (Juran on Leadership for Quality, Juran on Planning for Quality and Juran on Quality by Design) should be required reading for the Quality professional. As an Industrial Engineer, I had to work with the very thick Juran’s Quality Handbook in college. I had worked through many of the statistics and exercises, but I never fully appreciated Juran’s contributions until recently. Juran wanted us to see Quality as more than just inspecting and counting defects on the factory floor. We can see this in his broad definition of quality terms below like Fitness For User and Quality Function. • Fitness for Use – the extent to which the product successfully serves the purposes of the user during usage. Parameters for Fitness for Use include: quality of design, quality of conformance, abilities, and field service. • Quality Function - the entire collection of activities through which we achieve fitness for use, no matter where these activities are performed. In the 1940’s, Juran defined the Pareto principle―the principle of the vital few and the trivial many. In general, the principle states that by tackling the top 20% of the issues we can address 80% of the cost of poor quality. This concept is critical to focusing improvement projects on the areas that will have the bigger impact, but the Pareto principle can be applied to many things. The function of the Inspector might be as old as the pyramids of Egypt, but the Quality Control function as we know it today was defined during the World War II years. 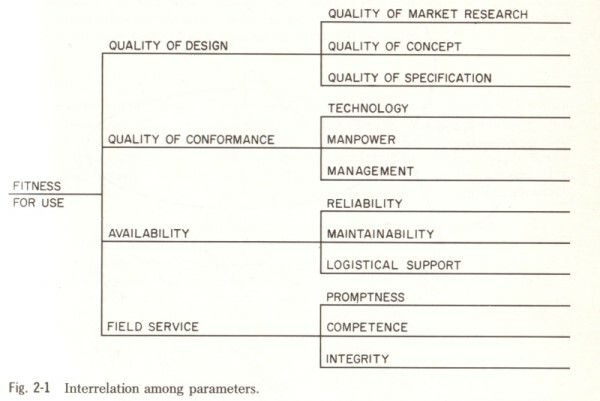 Juran was a pioneer in Customer Satisfaction and Total Quality Management. He understood that the Customer and the Manufacturer have very different views of product quality and cost. In more recent years, our views of Total Cost of Ownership are starting to align with the Customer’s view. Fool-proof the process if possible, train and empower the operators as much as possible, and put standards in place. Humans are fallible, biased and at times inattentive; therefore we must have procedures in place to compensate for human error. Juran also understood that we need to motivate people to take action and reduce errors. Motivation is driven by upper management communications and campaigns for quality. Even though, he did not believe in the general premises of the Zero Defect philosophies of the early 1960’s, he did acknowledge that they had some positive results. The personal pledge was a good motivator. He also studied other incentive and motivational methods including the Japanese QC Circle, the USSR Saratov System and the Polish DO RO (Dobra Robota) System. • Quality professionals not involved early enough in the design process and we do not give Quality the importance it needs during product and process design. • In many factories today, product designers are still developing new products, and then delivering the product specifications to the Manufacturing Department. • With the advent of electronic systems, many companies proceeded to convert their manual systems directly into electronic systems without first getting rid of the deficiencies in the manual systems. As a result, their manual mess became an automated mess. • Quality Planning has been done by amateurs. Process planners need to be trained to become professionals at quality planning. Juran also stressed that upper management had to drive a Quality philosophy in the company. • Quality must be a part of every agenda in the company. • The business plan should contain quality goals. • Each level must establish goals. • Everyone must be trained. • To establish and meet a goal, it must be measured...measure everything possible. • Give recognition for excellent achievements. The legacy of this hard working immigrant will be with us for a long time. The Juran Institute will continue to promote the Quality field, and the next generation of Quality thought leaders are sure to be inspired by Juran’s life and work. Where are the Aerospace Jobs Going? Not to Washington, not many to California, some to Alabama, some to Ohio, New Hampshire, Connecticut, some to China, Poland, Canada, France, United Kingdom, and several other places around the globe. Yes, Northrop Grumman and EADS (Airbus) won the KC-45 tanker contract over Boeing. Yes, there were more U.S. jobs in the Boeing proposal, than in the NG+EADS proposal. Yes, NG had the best technical and cost proposal. Should we be concerned? Should we be surprised? A long long time ago, we use to make all our military weapons and equipment in the US, but we also didn’t export any of it either. It was made in the US for the US. Today the A&D industry is a truly global industry. Instead of focusing on one contract, we need to expand our view and keep track of the trade with other countries. Especially with countries that are taking some of these jobs. Why? Because if these countries are buying other Aerospace products manufactured in the US, then they are also contributing to more Aerospace jobs in the US. As it turn outs, our A&D industry is doing pretty good in terms of trade when compared to some other industries. In this chart from AIA (http://www.aia-aerospace.org/) we see that except for Canada we are doing pretty good in Aerospace trade with many of these countries. How come no one is complaining about how many Aerospace jobs are going to Canada? I am concerned about several things that came to my attention from this news. 1. Are we losing the technical edge in Defense? in Engineering? 2. Can we direct some of that lobbying money to improving our designs and operations? 3. Can the West coast remain competitive in Manufacturing? The news of the KC-45 Tanker reminded me of hearing about the Presidential Helicopter in 2005. I was also concerned at first about how many jobs were going outside the country, but then my attention turned to the technical side. Are we loosing the Engineering edge? Are the U.K. and France turning out better solutions? Better Engineering? Between Boeing, NG, and GE they spent around $30M last year lobbying in D.C. What do you think they are spending right now? Perhaps we should spend less on lobbying and more on improving designs and improving operations, so we can have the best proposals. Is it a coincidence that the US is not ranking globally very high in math and science? Are we spending enough in education? Are we spending our education budget on the right things? We have increased our education spending over the last four years, but is it enough? We just had a huge education budget cut in California. Over $4B in cuts means laying off 57,000 teachers (20% of the state’s teaching workforce), or eliminating four weeks of the school year, or increasing class sizes by 23-25 percent. How is this going to improve our math and science scores? Washington and California have been losing Aerospace jobs, but Alabama, and North Carolina, are thriving and New Hampshire and Connecticut are holding on. What do their student-teacher ratios look like? Maybe it is a coincidence, but the jobs seem to be going to states with better student-teacher ratios. Alabama is becoming a big hub for Aerospace jobs and other states should take notice. They have an aggressive program to attract new business to the state, they have low real-estate cost, they are spending on education, and they have less union issues. California, Washington,… is it time to re-evaluate our policies on education, and our priorities on manufacturing jobs? Can we live on software alone? It will take some time, but it is going to take more investment in Engineering and Manufacturing in the US before we start seeing more announcements that the best propositions are coming from US ingenuity and from US manufacturers. It will take some time to rebuild the Aerospace expertise that has been lost because of the decline of military programs after the Cold War ended. Aerospace spending is on the rise now, so it looks promising in the future, if we can encourage our youth into Engineering and into the industry. Why is Manufacturing an Important Topic? 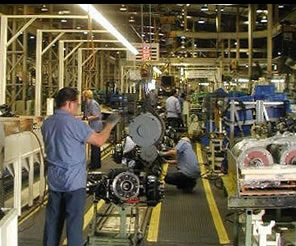 Fifty years ago, a third of U.S. employees worked in factories, making everything from clothing to cosmetics to cars. Today, a little more than one-tenth of the nation's workers are employed by manufacturing firms. Four-fifths are in services. The decline in manufacturing jobs has been accelerating. Since 2000, more than 2 million factory jobs have been cut — about 10% of the sector's workforce. During the same period, the number of jobs outside manufacturing has risen close to 2%. Many of the factory jobs are being cut as companies respond to a sharp rise in global competition. Unable to raise prices — and often forced to cut them — companies must find any way they can to reduce costs and hang onto profits. Manufacturing jobs are increasingly being moved abroad as companies take advantage of lower labor costs and position themselves to sell products to a growing — and promising — market abroad. Some economists say the change in manufacturing, albeit painful, is healthy for the sector and for the overall economy in the long run. I believe that manufacturing is needed to maintain a healthy GDP, trade balance and middle class. Many U.S. “manufacturers” are focusing on innovation, research and development, and moving actual production abroad. However, not all U.S. manufacturers are following this path. Some are keeping production in the U.S., increasing productivity, and creating innovative business models to remain competitive. We want to highlight these success stories and inspire others to take note and realize that moving production abroad is not the only option. If you are a manufacturing fan, I hope you will find the information on this blog interesting. I will share ideas, best practices and success stories from companies, teams and individuals that are leading the way to resurgence of a strong manufacturing sector in this country. I hope to recruit some more contributors and perhaps spark some interesting discussion.